Buddhavacana, from Pali and Sanskrit, means "the Word of the Buddha." It refers to the works accepted within a tradition as being the teachings of the Buddha. All traditions recognize certain texts as buddhavacana which make no claim to being the actual words of the historical Buddha, such as the Theragāthā and Vimalakīrti Nirdeśa Sūtra. According to Donald Lopez, criteria for determining what should be considered buddhavacana was developed at an early stage, and that the early formulations do not suggest that the Dharma is limited to what was spoken by the historical Buddha. The Mahāsāṃghika and the Mūlasarvāstivāda considered both the Buddha's discourses, as well those of the Buddha's disciples, to be buddhavacana. A number of different beings such as buddhas, disciples of the buddha, ṛṣis, and devas were considered capable to transmitting buddhavacana. The content of such a discourse was then to be collated with the sūtras, compared with the Vinaya, and evaluated against the nature of the Dharma. These texts may then be certified as true buddhavacana by a buddha, a saṃgha, a small group of elders, or one knowledgeable elder. Given the extraordinary extent of material passing at any one time under the rubric of the "word of the Buddha," we might simply pause and acknowledge that Indian Buddhists were extraordinarily facile literateurs. [...] Institutional creativity of this order, at this level, over this length of time, is sheer inspired genius. 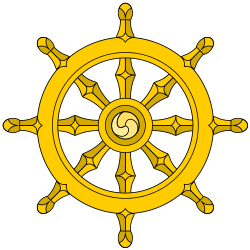 In Theravada Buddhism, the standard collection of buddhavacana is the Pali Canon. The oral tradition of the Theravadin recension of Buddhist texts dates back to the time of the Buddha but was not written down until 29 BCE, with continuous revisions up to about 500 CE, taking its present form. In Tibetan Buddhism, what is considered buddhavacana is collected in the Kangyur. The East Asian and Tibetan Buddhist canons always combined Buddhavacana with other literature in their standard collected editions. However, the general view of what is and is not buddhavacana is broadly similar between East Asian Buddhism and Tibetan Buddhism. Skilling, Peter (2010). "Scriptural Authenticity and the Sravaka Schools". The Eastern Buddhist. 41 (2): 1–48.